The Primobucconidae occur in early Eocene (MP 8/9-11) deposits of North America and Europe. The first species, Primobucco mcgrewi, was described by Brodkorb (1970) on the basis of a wing from the Green River Formation, and was considered to be the earliest representative of the Neotropical piciform puff-birds (Bucconidae). Feduccia and Martin (1976) classified P. mcgrewi in the taxon Primobucconidae, to which they also assigned other early Eocene fossils. The Primobucconidae sensu Feduccia and Martin (1976) are, however, polyphyletic (Houde and Olson 1989, 1992; Mayr and Peters 1998), and the taxon now only includes the species of Primobucco. As first recognized by Houde and Olson (1989), this latter taxon is a stem group representative of the Coraciidae/Brachypteraciidae. 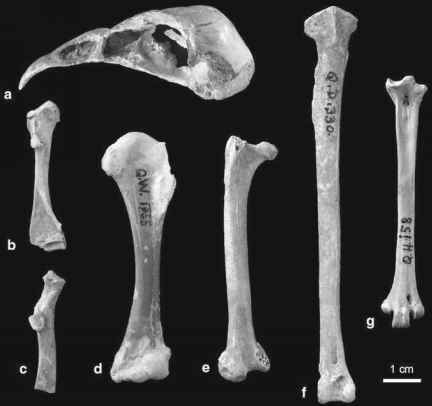 Houde and Olson (1989) further identified a complete skeleton of P. mcgrewi from the Green River Formation. This fossil was studied in some more detail by Mayr et al. (2004), who described two very similar species from Messel as P. perneri and P. frugilegus. A three-dimensionally preserved tarsometatarsus of an unidentified species of the Primobucconidae was also reported from the early Eocene of France (Mayr et al. 2004). Specimens from the early Eocene of England, which were referred to the Primobucconidae by Olson and Feduccia (1979) and Harrison (1982a), have been wrongly identified (Mayr et al. 2004). The species of Primobucco are short-legged birds and are much smaller than the representatives of the Eocoraciidae, Geranopteridae, and extant rollers. They are distinguished from the Eocoraciidae and Geranopteridae in the less robust beak and a proportionally shorter postorbital process. A presumably autapomorphic feature is the large distal vascular foramen of the tarsometatarsus.